Cameroon should adopt legislation governing police use of firearms. International law restricts use to where it is necessary to confront an imminent threat of death or serious injury or a grave and proximate threat to life. every person has a right to life, to physical and moral integrity and to humane treatment in all circumstances. Under no circumstances shall any person be subjected to torture, to cruel, inhumane or degrading treatment.Preamble, §12, to the 1972 Constitution (as amended through 2008). The Constitution guarantees freedom of assembly "under the conditions fixed by law".Preamble, §16, to the 1972 Constitution (as amended through 2008). The Constitution does not refer to the duties of the police but the legislative branch of the state is responsible for "safeguarding individual freedom and security".Art. 26(2)(a)(1), 1972 Constitution (as amended through 2008). There are two main bodies of police in Cameroon: the regular police force (Sûreté nationale), reporting to the Presidency, and the Gendarmerie Nationale, a paramilitary police force under the Ministry of Defence. By 2012 Presidential Decree, the Sûreté nationale was given concurrent responsibility for ensuring respect and protection of institutions, freedoms, individuals, and property.Art. 2(1), Decree N° 2012/539 of 19 November 2012. 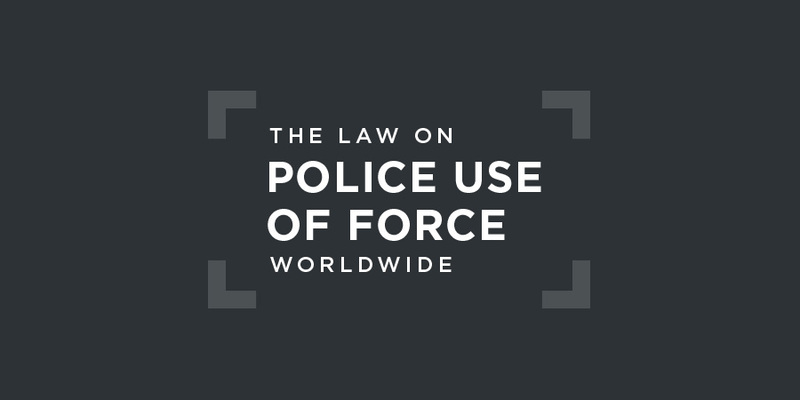 According to the 2005 Code of Criminal Procedure, a law enforcement official may use "reasonable force necessary" to effect an arrest:S. 30(2), 2005 Code of Criminal Procedure. A judicial police officer, agent of judicial police or any officer of the forces of law and order effecting an arrest, shall order the person to be arrested to follow him and, in the event of refusal, he shall use reasonable force necessary to arrest the person. The 2016 Penal Code prohibits the use of torture as does the 2005 Code of Criminal Procedure, which stipulates that a suspect in police custodyS. 122(2), 2005 Code of Criminal Procedure. The penalty for torture leading to permanent deprivation of an organ, limb, or sense is between ten and twenty years imprisonment.S. 277(2), 2016 Penal Code.Ordering the “use of public force against the enforcement of any provision of law or regulation, or against any lawful order, whether judicial or administrative” is punished by a sentence of a term of imprisonment of between three and ten years.S. 128, 2016 Penal Code. The Prison Administration is under the Ministry of Justice.Décret n° 2004/320 du 8 décembre 2004 portant organisation du Gouvernement.According to a 1983 Ordinance,Ordinance N° 080 of 16 May 1983 concerning the disciplinary regime of Prison Administration Personnel.sanctions are to be applied to any prison officer who is guilty of torture or other ill-treatment of detainees. "Report of the Special Rapporteur, Manfred Nowak, Addendum: Follow-up to the recommendations made by the Special Rapporteur", UN doc. E/CN.4/2006/6/Add.2, 21 March 2006, §63. There is no independent police oversight body in Cameroon but an internal section within the national police, the Special Division for Service Oversight, was established in 2005 by Presidential decree.Decree N° 2005/065 of 23 February 2005 concerning the organisation et fonctioning of the Special Division for Service Oversight.Ensuring compliance with international human rights law is a responsibilty of the General Directorate for the National Police. In December 2016, Amnesty International called upon the authorities toAmnesty International, "Cameroon: Excessive force that led to deaths of protesters must be urgently investigated", 9 December 2016.
investigate the use of excessive and unnecessary force that led to the deaths of between two and four people during a protest in the north western city of Bamenda. Eye witnesses recounted that security forces fired live rounds and teargas in reaction to people throwing stones, describing how they saw the bodies of two men who had been shot dead. Media reports quoting police sources have reported that at least four people were killed. Security forces were also seen launching teargas into an area apparently unrelated to the protests, as well as firing live ammunition in the air. No investigation appears to have been conducted. In 2017, the UN Committee against Torture expressed its deep concern about reports of summary execution and enforced disappearance of dozens of people during the course of Cameroon’s counterterrorism operations against Boko Haram in 2014 and in subsequent years.Committee against Torture, Concluding Observations on Cameroon’s fifth periodic report, UN doc. CAT/C/CMR/CO/5, 15 November 2017, §9.The Committee called on Cameroon to immediately take measures to strengthen the protection of civilians and to exercise strict control over the security forces with a view to preventing extrajudicial executions, enforced disappearance, and arbitrary detention.Committee against Torture, Concluding Observations on Cameroon’s fifth periodic report, UN doc. CAT/C/CMR/CO/5, 15 November 2017, §10(a).It further called on Cameroon to provide effective reparation to all of Boko Haram’s victims, including equitable and adequate compensation, and affording the most comprehensive rehabilitation possible.Committee against Torture, Concluding Observations on Cameroon’s fifth periodic report, UN doc. CAT/C/CMR/CO/5, 15 November 2017, §10(g). In 2006, the UN Special Rapporteur on Torture included in his report details provided by the Government of Cameroon on prosecutions for unlawful use of force by the police and prison officers. "Report of the Special Rapporteur, Manfred Nowak, Addendum: Follow-up to the recommendations made by the Special Rapporteur", UN doc. E/CN.4/2006/6/Add.2, 21 March 2006, §§57-120.In its report on human rights in Cameroon in 2006, the United States Department of State reported that in October 2006, the Kribi High Court sentenced Police Commissioner Japhet Bello Miagougoudom to 15 years in prison and awarded $40,000 to the family of Jean-Pierre Mpohede who the Commissioner had shot dead in in March 2005. The court also sentenced Police Inspector Aboubakari Modibo to 10 years in jail but acquitted the seven other co-defendants.